The historic Heritage House was the perfect simplistic Arroyo Grande wedding venue for this floral and fun garden party wedding! Surrounded by close friends and family, the bride and groom said "I do" under a handmade copper altar with hanging colorful flowers by Lori Boe Floral Design. The couple's creative and unique style reflected the full-of-life wedding day and was beautifully captured by Chromatic Collective. 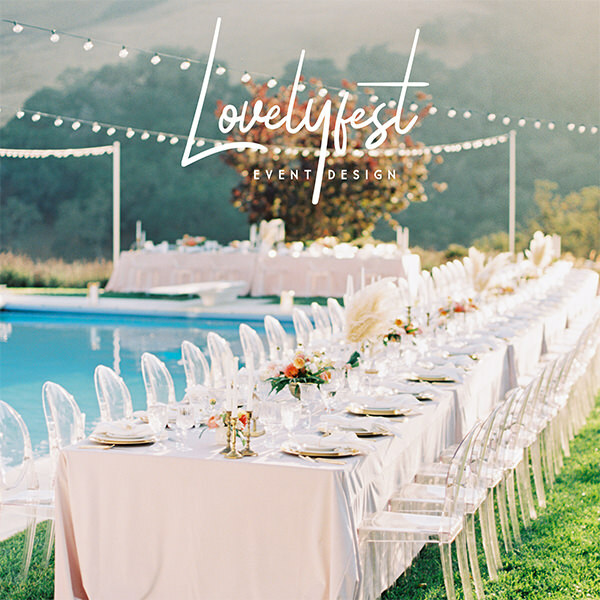 From the couple on their vision for the wedding: "We wanted to throw a kind of modern garden party. We wanted it to be simple and uncomplicated but still really fun and personal. Our talented friends were involved in many important aspects of the wedding - photography, DJ, bartending, and our Reverend Josh Ralph. We searched all over for venues that would give us the freedom to do whatever we wanted, and that turned out to be pretty hard to find. Luckily we stumbled upon Heritage House one weekend while we were back home. 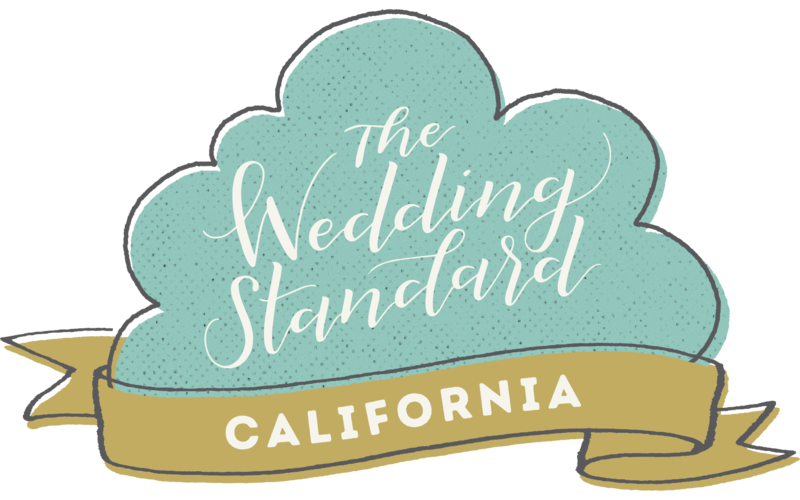 We loved that they didn't force us into "preferred vendors" or have strict rules about anything. The only thing really throwing off our vibe was the gazebo. Most people get married under it, but it was so Victorian looking that we felt we had to direct the attention elsewhere. We shifted everything sideways and built our own copper altar to get married under and used the gazebo as a bar. We tried to direct the attention inside the gazebo as much as possible by hanging a big pendant light inside and wrapping the bar in copper." Colorful and fun garden roses, ranunculus, and fresh eucalyptus greens created the perfectly unique bouquet (by Lori Boe Floral Design) to match the bride's beautiful style. "The bridesmaid's dresses were a collaboration between Dylan and their friend Nicole, who has a bikini and clothing company called Beachriot. The floral print was actually adapted from the pattern on the linoleum floor in the kitchen of his family's 1930's cabin up in Lake Tahoe. They changed the colors to match the theme of the wedding, and Nicole designed the fit and style of the dresses." "Dylan and his Dad built the copper altar together in his shop a couple of weeks before the wedding. It was constructed from one solid piece of one-inch copper pipe and hand-polished for about 8 hours. It was definitely a labor of love. Their florist, Lori Boe, turned it into one of Jess's favorite pieces at the wedding by hanging flowers from it that faded from pink to white." 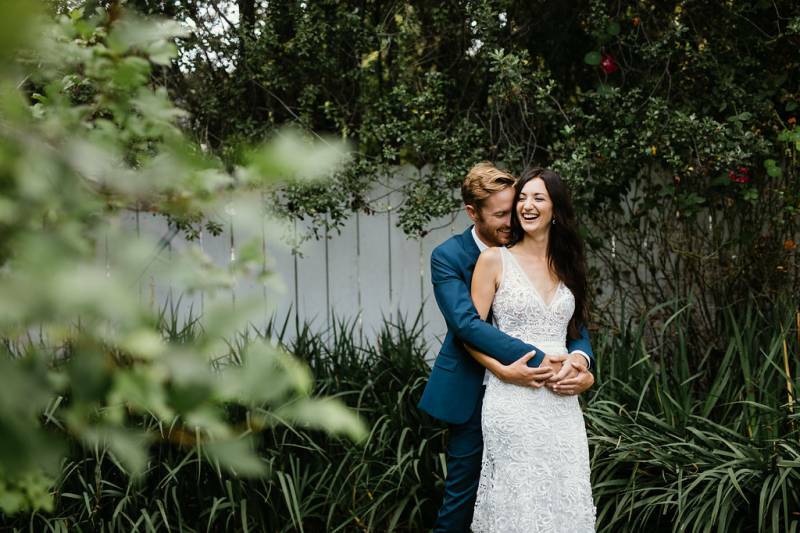 Chromatic Collective did an amazing job to uniquely capture the creative style of the couple and to thoughtfully show each and every special emotion-filled moment. "I remember showing up to the Avila Village Inn where Jess was getting ready at. She was surrounded by her mom, sisters and closest friends exchanging laughs as hair and make up were finishing up. Within a few minutes of saying hello and hanging out I knew how the day would turn out. Awesome, of course :) I could tell real quick how important and close Jess is with her sisters, and I made it my focus to really showcase that throughout the day. I think conveying confidence while maintaining a level of excitement goes a long way. For a wedding photographer, this is huge and allows you to really make your bride feel like themselves on their wedding day. The wedding photos are a direct reflection of the emotions that were expressed, something they can forever hold onto. If your bride trusts you, and you can do your part in showing them how they deserve to feel on their wedding day, you've done a great job. The camera stuff is the easy part." "During the kiss at the ceremony, confetti (dried rose petals) shot through the air from behind the altar. It seemed like a magical fairytale which added so much dynamic and awe to their wedding. Jess and Dylan came up with the idea after a concert at the Santa Barbara Bowl. They where in the pit area close to the stage, and towards the end of the show this confetti cannon went off for like probably 3 minutes straight. That was a really exciting feeling that they wanted to capture at their wedding." "When we found out the venue wouldn't allow confetti, but only "natural" materials, we decided to blow half our wedding budget on dried rose petals. And instead of renting or buying a confetti cannon like normal people, we just told Gig (Dylan's dad) about our idea. He went into his shop and had one made about an hour later." -From the bride. How did the wedding design express the couple's personality or love story? "I think most couples see a venue layout and a few elements they can take from pinterest or other hip weddings and thats enough. For Jess and Dylan they really wanted to showcase their creativity through their wedding. You can tell what is important to a bride and groom by how much detail and thought is put into certain things. Nothing got overlooked and they really focused on creating a great guest experience where it counted the most." 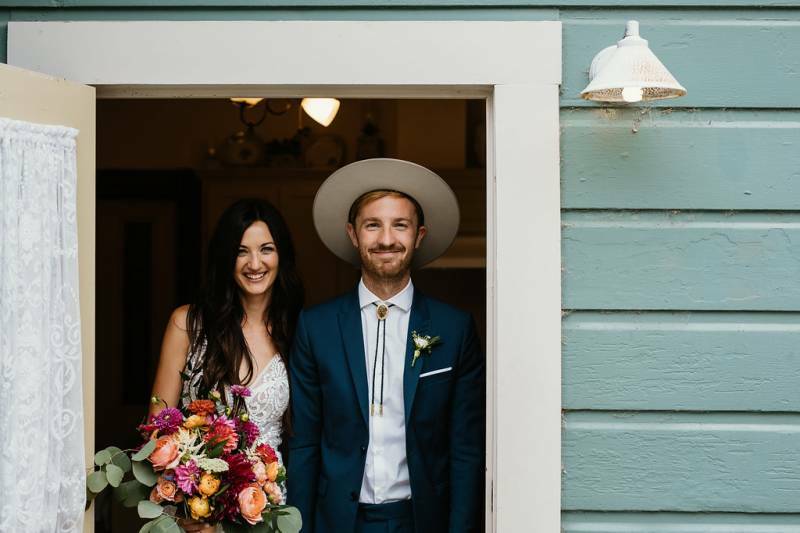 "The bar was actually a wedding gift from their old friend Jory Brigham. Jory makes amazing furniture, so when Jess and Dylan were looking to recreate the bar space at the venue and distract from the Victorian theme of the gazebo, Jory came through with this amazing piece that stole the show. One exciting aspect of it was the element of surprise; Jess and Dylan hadn't seen it until the wedding day. As a photographer you get to witness first hand a lot of wedding moments. 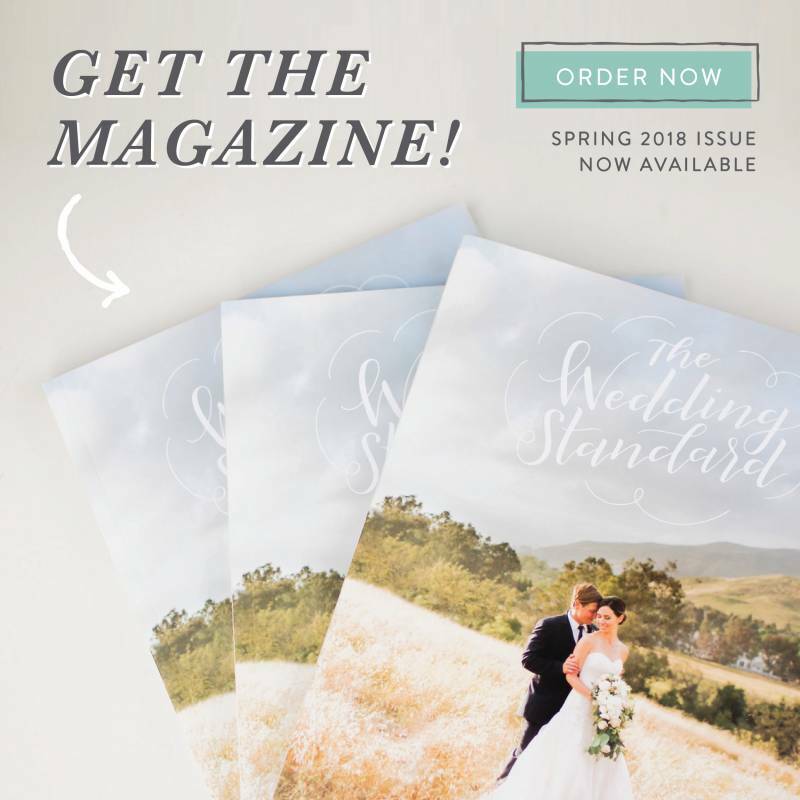 One of my personal favorites are seeing the bride and grooms reactions when they first see their ceremony and reception set up for the first time. All of those countless hours of planning and seeing its fruition exceed your vision. Those reactions of excitement are priceless and these wedding details really showed that." "An awesome vendor I enjoyed was their DJ, Josh Hartley. You could tell how relaxed and how into his element he was by how he made the day flow. It's important for a DJ to not only work with couples to play music they enjoy but to also make sure guests are dancing. This was never an issue as the dance floor was packed the entire time. Josh also kept their guests laughing at just the right times with his use of party horn sounds, it was hilarious."